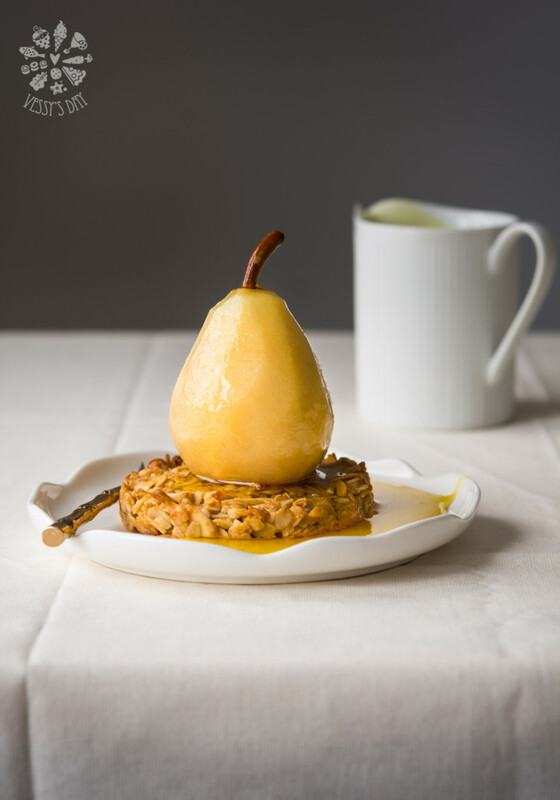 If you wonder how great these poached pears are… let me tell you, they are simply amazing! So flavorful and so easy to prepare. 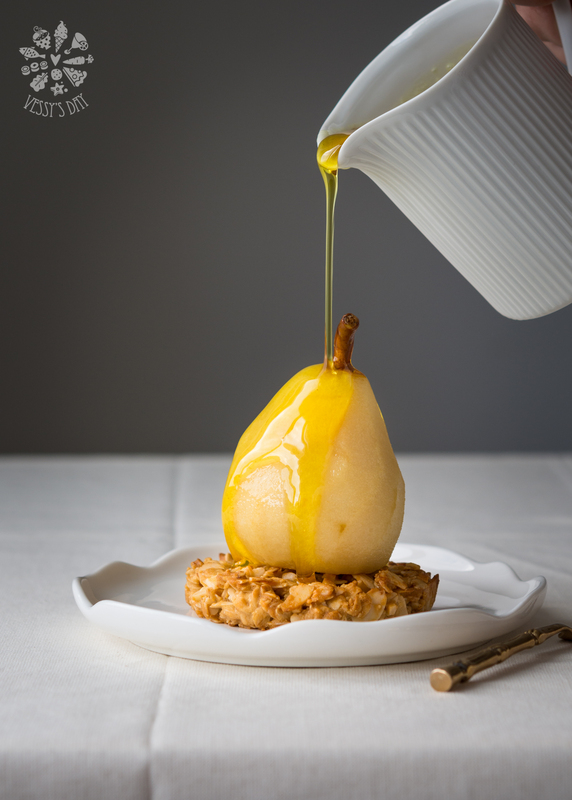 Poached pears take only 30 minutes to prepare, same as the oat cookies. 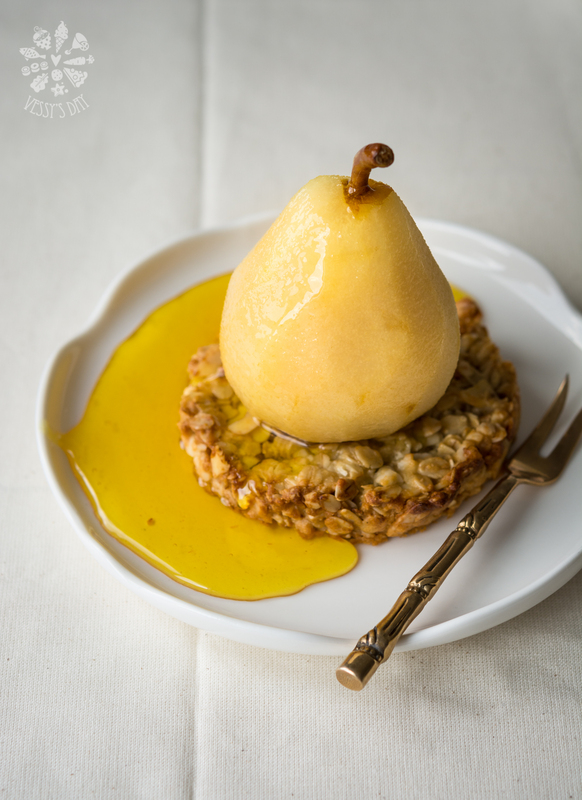 You can easily put the cookies in the oven while you are working on the pears, which saves you a lot of time. 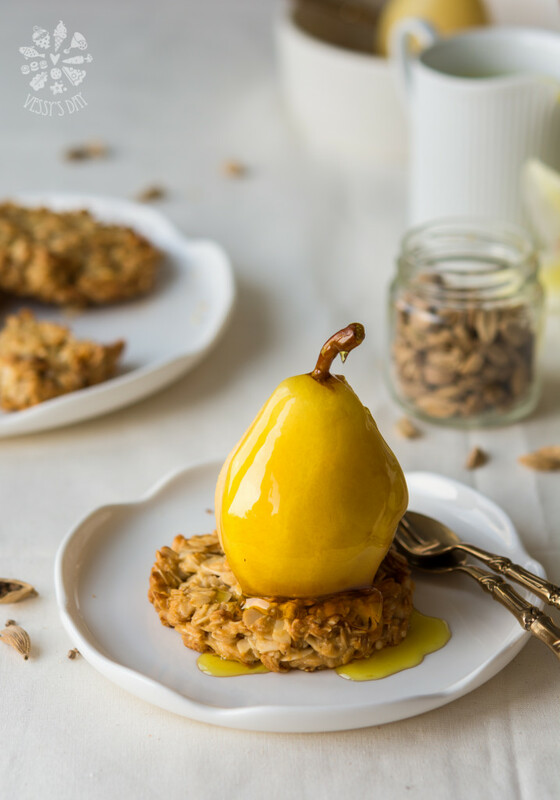 Oat cookies not only go great with the pears, but they are also very delicious on their own. They would be a great breakfast on the go or an afternoon power snack. I got inspired for this dessert, during our summer vocation in Greece this year. We stayed at the dreamy Ikos Olivia resort. That place is amazing in so many ways, but most of all it’s super kids friendly. Since we had our baby boy…we have been adjusting to the change and realizing that we have to look for a vocation place that will meet our child’s needs above ours. So, that’s how we found Ikos Olivia and we all loved it. It’s the best family place I’ve been to, so far. If you are planning to go to Greece soon, just check it out, you might like it. And that’s where I had my first saffron poached pear. It was served with vanilla ice-cream and crumble base, as I faintly remember. 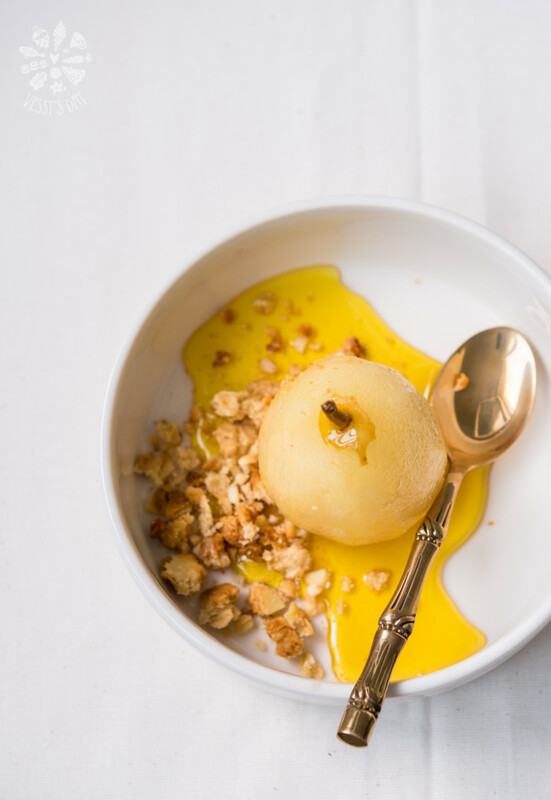 The saffron poached pear stuck on my mind, thou, it was so amazing, that I decided to try and make it myself. It’s not the same as the one I had at the hotel, of course, but I love my interpretation of that 5* dessert and hope you will love it too. Preheat your oven to 180C. Line a cookie sheet with parchment paper. In a large bowl add honey, vanilla extract, melted butter and stir to completely combine. Add oats, flour, shaved and crushed almonds and a pinch of salt. Stir to combine. Now, to shape dough into round cookies/pates you may use a round cookie cutter or a dessert ring. Place the ring on the cookie sheet and fill with a tablespoon or two of the dough. Use the spoon to press down the dough tightly into the ring. Remove the ring and repeat these steps until dough is up. Bake cookies for about 15 minutes or until lightly browned on around the edges. Remove cookies out of the oven and let cool to room temperature. 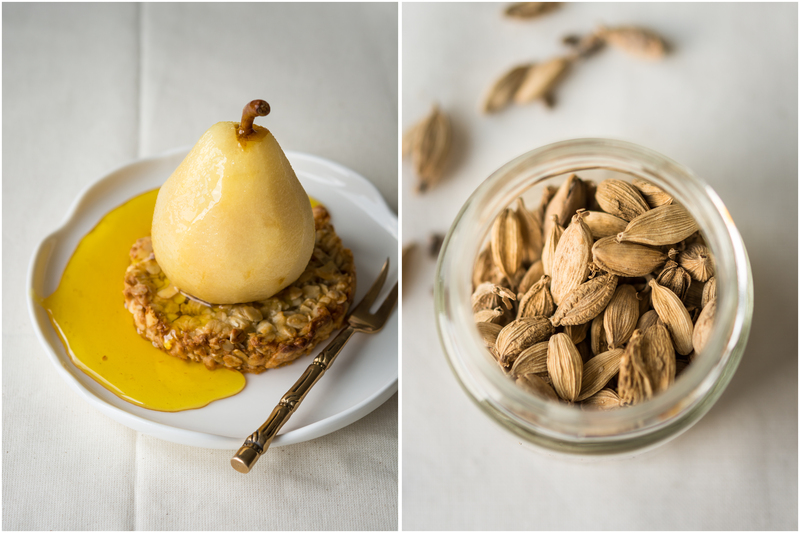 At first, cookies will be soft, but once they cool off they will harden and turn into these crisp, crunchy oat cookies. You will make about 6-8 large cookies out of this dough. Keep left over cookies in the fridge. In a large enough saucepan to fit 4 pears, combine water, sugar, saffron, cardamom and vanilla pods and bring to the boil. Add pears and cook for about 20 to 30 minutes, depending on the ripeness of your pears. Check them using a small knife to see if they are ready. If you are using a very ripe pears, they will cook quickly. Be careful not to overcook the pears. You want to have them soft, but still in perfect shape. Once ready, remove them from the pot and set aside to cool to room temperature. Continue to cook the syrup until it thickens – more or less, depending on your preferences. Strain through a fine mesh and set aside to cool to room temperature. 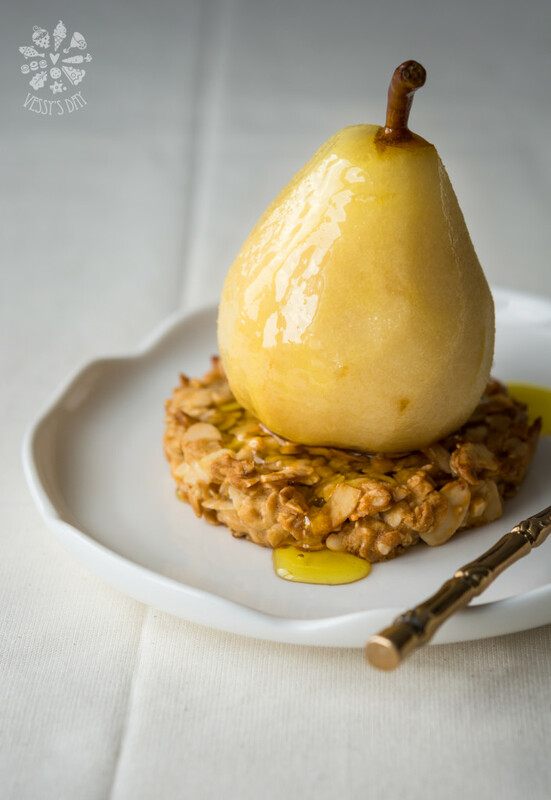 To serve: arrange cookies on a plate then add one pear over each cookie and sprinkle them with a little bit of the saffron syrup. ***Keep left over syrup in the fridge. In case it hardens, just reheat to use for another serving or recipe.